Over the weekend, we were all thrilled by the story of a Banksy art print that automatically shredded itself after being sold for over $1 million at an auction held by Sotheby’s in London, partly because it was a nice way to make some millionaire feel like a dummy (even if the shredded work is probably more valuable) and partly because it was nice to see Banksy pulling something clever again after his “crappy Disneyland” stunt from 2015. Now that we’re separated from the whole thing by a few days, though, the world is starting to question just how real the whole thing was. After all, the Banksy print was being displayed in a comically large frame, so Sotheby’s probably should’ve known that something was up, and internet sleuths have even begun to question if the real print was shredded or if a fake print simply popped out of the bottom of the frame in tatters. That extra bit of paper at the bottom indicates that a piece of the print had been on some kind of roller ahead of time and had already been cut by the razors, with Bailey comparing it to the way you slice a piece of wrapper paper with an open pair of scissors. The cuts on the print in the photo also seem to line up with the umber of razors that Banksy installed, suggesting that print really did get shredded. As for Sotheby’s involvement, that seems a little more questionable. 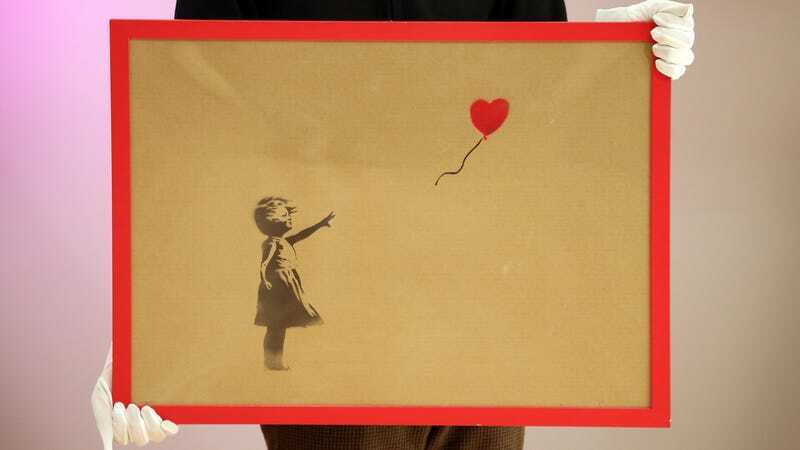 The Banksy print was the last auction of the day, seemingly implying that Sotheby’s set it aside for a big event, but it’s possible that was just luck on Banksy’s part. Then there’s the frame, which is obviously super shady, but Sotheby’s did supposedly question it. Pest Control, the group that verifies possible Banksy stuff, said that it was an integral part of the piece, so the auction house apparently just accepted it as Banksy trying to “poke fun at the establishment.” Bailey doesn’t really buy that Sotheby’s didn’t know what was going to happen, though, theorizing that it knew Banksy was going to do something but that it didn’t specifically know that the print would be auto-shredded. Maybe the real prank was the friends we made along the way?